We’ve taken our outreach efforts ‘on the road’ by demonstrating the Portable Radio Telescope (PBT – itty bitty radio telescope ) hardware at the National NEAF 2014 Astronomy Conference outside of New York City, to very interested attendees and global vendors! We were invited to attend the Solar Star Party in the courtyard of Rockland Community College (site of NEAF), along with optical Solar Telescopes. Using our nearly completed Portable Radio Telescope, we demonstrated radio emissions coming from the Sun, and warm body RF emissions from living things (trees, people, etc.). This was an instant hit, especially when we were able to track RF emissions from geosynchronous satellites in the stationary ‘Clark’ orbit, including showing a ‘strip chart’ record of the results on a laptop PC. Successful demonstration of our high resolution ‘turntable’ antenna for the IBT enabled repeatable 1-2 degree pointing resolution, and digital data to the netbook PC. (Picture #1). Magazine editors, including two from Europe asked if we’d consider contributions to their publications, (including an offer from a book publisher!). We gave away every piece of paper, business cards, and web address info pointers to the crowds. It seems that no one in optical astronomy has considered actually doing astronomy in the RF spectrum, thinking it was outside the realm of amateurs (our plans are to change that). Amateur radio operators (‘Hams’) saw our efforts as a logical extension of their field. Hint – our 2015 plans are to build a ‘bridge’ to the local Radio ‘Ham’ group (Rochester Amateur Radio Association – RaRa). One of our U of R students has even successfully characterized a set of Low Noise Amplifiers (LNAs), using a simple set of CFL light bulbs as an RF source (topic for a future RaRa talk). Ultimately, once we write an operating manual & create experimental worksheets, this PBT will become a Boy Scouts activity in Ionia (probably the summer of 2015), when they can camp-out there on weekends, (even if it’s cloudy). The Solar Radio Telescope project is coming together nicely. The purpose of this project is to study RF emissions from and ‘Angry’ Sun (visible sunspots, Pix # 2) This last school year, (Fall 2013, Summer & Spring of 2014 semesters), we have had U of R students working on getting both the primary & secondary receivers working under the control of a desktop PC (Win XP). The latest updated Callisto software (v118) has been loaded & has begun operating without any major problems. We have successfully loaded and run the initial ‘Radio Eyes’ Planetarium program displaying the night sky in the RF environment (like the visible Starry Night sky, but in the RF spectrum). Students have been able to measure the local horizon (elevation) in Ionia every 10 degrees of the compass, and generated an actual horizon file to display when celestial objects will come into view from our physical location (Picture #3). And have begun to design an operator’s ‘virtual’ front panel in LabView to control all critical functions, and programs. Two U of R summer students have just finished selecting PC hardware to be installed in a weather-proof enclosure with the 7 ft. receiving antenna, and run under Windows 7. We’ve even sampled the RF environment in Ionia to begin identifying potential interference sources. Our winter plans are to begin formulating a strategy to deal with this possibility. We are elated that our Solar RT project has been one of the projects selected by RIT’s engineering department’s competition for their senior design activities. A team of seven students are designing phase II for our project to track the Sun in its daily movement. Suntracker Project Logo (Picture #4). This effort includes customer requirements, animated simulations of the Sun’s movement from summer through winter, and the servos, electronic controls, and mechanical mounts. In the spring semester (2015) they will actually build this hardware, take it out of the lab, and install it in Ionia! Farash foresight & support of these special programs have created a unique environment that has not just benefitted ASRAS, but given students the chance to take concepts out of the textbook, and build actual working hardware, making for a solid, and lasting, engineering education. The scope of this effort will not only enable us to contribute to the eCallisto network, but give the Rochester Academy of Science global visibility & participate in an activity to study our ‘angry’ Sun’s sunspots, CMEs, and Earth directed potential hazards (Pix #5). 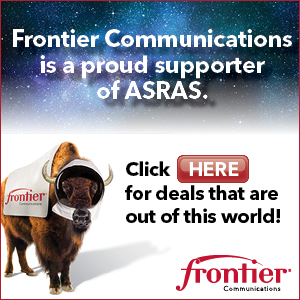 As a long time ASRAS member, I feel that I’m blessed to be a part of this activity. Elliott Montroll Lecture Series at U of R in February ! June 17 2017 : From Marty Pepe – Radio Astronomy news ! First annual Telescope Tune Up Day ! Click on the speaker to hear a recording of this months observable highlights ! Need this months newsletter ? Missing this months newsletter ? Not on the reflector email list ? To get your copy !